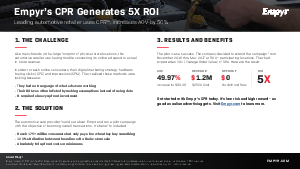 The Empyr CPR campaign has been one of our best performing digital marketing campaigns because of the one-hundred percent attribution of the digital marketing spend to in-store sales. We finally are buying revenue and not ads. One of the biggest challenges for advertisers today is the gap between online advertising spend and in-store sales. Empyr has truly solved this challenge with their card-linked offers platform.